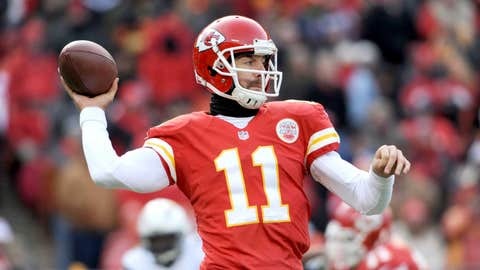 Alex Smith, the best Chiefs quarterback since Trent Green, was obtained for two second-round draft picks. And those two picks can be quantified. KANSAS CITY, Mo. — The short version goes like this: Cutting the cord with Alex Smith after two seasons is the NFL equivalent of lighting a garbage bag full of $100 bills on fire, then walking away. If you’re a Kansas City Chiefs fan, don’t look at Smith as the best signal-caller the franchise has had under center since Trent Green, even though that’s patently true. Look at him for what he cost: That is, two second-round draft picks. Given that, when pondering the question of whether to try and extend Smith, who’s slated to make $7.5 million in base salary this fall and could become a free agent in 2015, well — it’s not really much of a question. "My agent handles all that, and that was why you hire that guy to take care of that, so you can focus on football," Smith said earlier this week. "That’s not really my place. I have a contract for this year." He needs one for next year, too. And probably the year after that, too. As to why, well, here’s the long version. Buckle up. 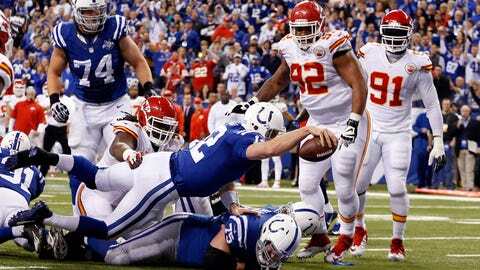 First: In order to pluck Smith from the San Francisco 49ers, the Chiefs surrendered pick No. 34 (which the Niners flipped to Tennessee and moved down to 40) in the 2013 NFL Draft and the 24th pick in the second round, No. 56 overall, in ’14. Last spring’s second-rounder turned into defensive lineman Cornelius "Tank" Carradine for the 49ers, who signed a four-year deal through 2016 for $4.95 million, with a cap number of $1.124 million this fall. So what could the Chiefs have gotten from pick No. 34 in ’13 and pick No. 56 in ’14, based on generation of NFL production by players taken at that position? In November 2011, Kevin Meers of Harvard Sports Analysis posted an excellent study that incorporates the traditional, Jimmy Johnson-style "value" method of assigning points to draft picks, but replaces those points with a percentage based on how much better a player’s career turned out to be relative to the average player drafted during that same time period. In this case, Meers used Pro-Football-Reference.com’s career approximate value (or CAV) points — in which players usually score anywhere from 0 to 24 in a single season, regardless of position, and rated picks based on how the guys in those slots performed from 1980-2005 compared to the "average" draft pick. Meers then assigned each draft slot a percentage relative to how the players at that slot actually produced relative to that "average" selection. So: As a baseline, the 94th pick was the "average" selection, with a draft value of 100.3 (as in 100.3 percent of the value of an "average" draft pick) while posting a career approximate value number of 15. All other picks from 1980-2005 were rated based on a CAV of 15 being the "average" contributions, career-wise, for an NFL pick during that span. NFL CHEERLEADERS: Check out our gallery of sideline shots from around the league. According to the chart, the No. 34 pick was worth 173.3 percent of the value of pick No. 94, or 26 points in CAV. The No. 56 pick was worth 138.9 percent of the value of pick No. 94, or 21 points in CAV. Basically, the Chiefs missed out on 47 CAV points — this is the number to remember — in the Smith trade. Or roughly the career equivalent of one Elvis Grbac (47 CAV), Martin Bayless (46 CAV) or Lonnie Marts (46 CAV). Now let’s apply that tally to Smith. No. 11 recorded 14 single-season AV points for the Chiefs this past fall, thanks to an efficient ratio of 23 touchdowns (a new single-season best) against just seven interceptions, as well as 431 rushing yards (another career single-season high). While CAV is calculated on a sliding scale — 100 percent of a player’s best single-season AV, 95 percent of his second-best season, and so on — the numerology is close enough. Bottom line: Smith would need to post at least two more seasons of similar statistical quality to 2013 — and perhaps three — to remotely justify the value of what those two second-rounders were likely have to provided, career-wise, to the Chiefs. That trade needs to turn up at least 32 more AV points — again, players usually produce anywhere between 0 and 24 in a season — for the Chiefs to come out with a wash. The NFL’s single-season leaders in AV last fall were two names you’d expect and one you wouldn’t: Peyton Manning (19), Richard Sherman (19) and Denver offensive lineman Louis Vasquez (19); Jamaal Charles rated a 16. Any AV over 10 in a single season is pretty much Pro Bowl territory; any number over 20 is probably historic. Compared to Jay Cutler ($17.5 million in base pay in ’14), Eli Manning ($15.1 million), Peyton Manning ($15.0 million) and Sam Bradford ($14 million), Smith’s $7.5 million base is a relative bargain. But he won’t be for long. ProFootbalTalk.com reported this week that Smith’s talks with the Chiefs were going "slowly," and that the ballpark figure on the table is roughly $14-17 million per season. Which is a king-size numbers headache for general manager John Dorsey, given that he has only an estimated $4.569 million in cap space to play with this fall, according to OverTheCap.com. Moreover, he invested too much in wideout Dwayne Bowe ($8.75 million base in ’14) and is faced with some hard, long-term decisions to make in terms of safety Eric Berry ($8.4 million base in ’14), Tamba Hali ($6.25 million) and Brandon Flowers ($5.25 million). "I’ve played long enough, going into Year 10 now — it’s all year to year, in my mind, anyway, at this point," Smith said. "You’ve got to continually prove yourself. I don’t think it changes anything as far as my mindset or approach to the game." That said, the man’s bargaining position has never been better. He’s coming off the two best statistical seasons of his career and is playing at his peak, right now, both in terms of his personal parabola and the usual cycle of NFL signal-callers. But what goes up will, eventually, come back down again. The only question is when. It doesn’t figure to be soon, though, and letting Smith walk in 2015 is like chucking money down the proverbial drain. And that’s not the kind of scratch that Dorsey can afford to part with.